With an impressive display of expertise throughout the events, we hope our versatile BMP41 printer helps you to continue with your labeling excellence on the job. Brady (NYSE:BRC), a global leader in industrial and safety printing systems and solutions, congratulates the Cable Skills Challenge winner with a Brady BMP®41 label printer. 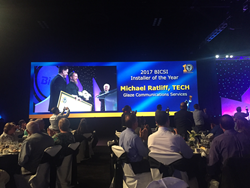 During the BICSI Winter Conference and Exhibition in January, a Cabling Skills Challenge was held with a number of events, concluding with the naming of Michael Ratliff as the 2017 Installer of the Year. The competition was comprised of seven events, including SCS installation, copper cable termination, firestopping, grounding and bonding, fiber termination and fusion splicing, cable assembly, cable troubleshooting/technical support, competency exam, and professionalism/orientation, as well as special speed challenge events. BICSI-credentialed installers and technicians were invited to apply for the Cabling Skills Challenge, and competitors were selected based on professionalism, quality of resume and work experience. After being selected to compete, Michael Ratliff from Glaze Communication Services Inc. took home the win. To support the 2017 Installer of the Year, Brady provided Ratliff with a BMP41 label printer. This rugged, hand-held printer gives users the versatility of both die-cut and continuous labels, along with auto-formatting labels, an easy user interface and reliable label performance.